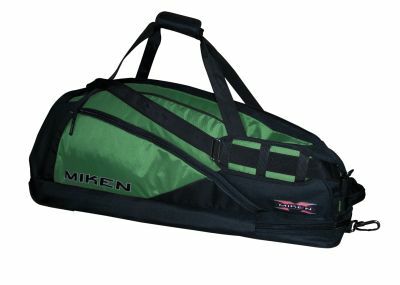 Miken Heavy Duty Wheeled Bag.Royal Green and Black. Great Travel Team Bag. 2 year warranty. Shipping $15.00. Team discounts available. Overall Size 35.5"W x 12.5"H x 11.75"D. Two Year Warranty. Open design for easy access to all of your gear. Angled pocket with inside valuables pocket easily accessible when bag is hanging or lying flat. Holds up to 4 bats. Heavy Duty Tank Wheels.